I have a hive that I think has swarm 3 times. 2 suspects and 1 no doubt over an 18 day period. Last swarm was April 10th. I went in today and there is no eggs nor brood. Do they begin the hives new queen after the first swarm or last swarm? Just trying to figure out if the hive is queenless or maybe still have a virgin and I need to wait a little longer. Just doing the math: If they swarmed April 10, typically leaving a capped queen cell. It may take a few days to a week for her to hatch. Then there's the time it takes for mating flights. Then for her to start laying eggs. If there was a virgin running around the hive when they swarmed then it could be as little as a week. 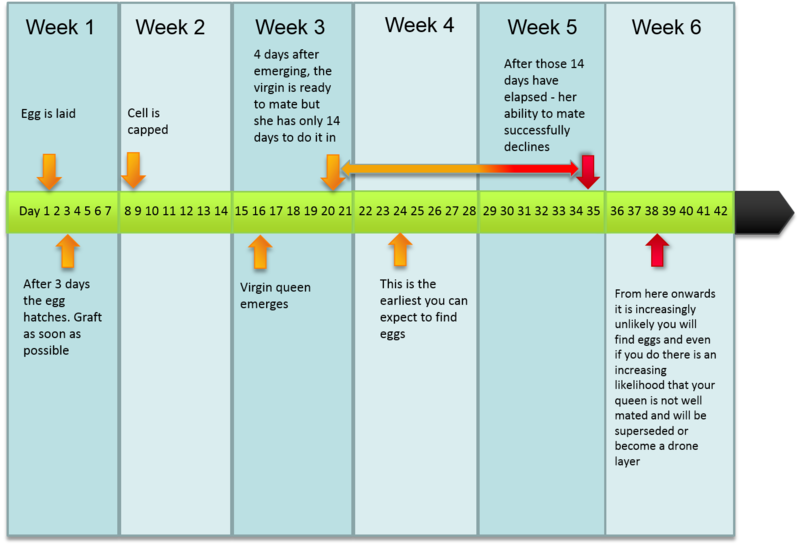 If the queen cell was just capped then it could be as long as 3 weeks. Typically when I make a nuc with a capped queen cell, I wait about 3-4 weeks before opening it up to check on the queen. When a hive Super Swarms, my term for a hive that swarms over and over, the queens are being kept in their cells after the time they normally would hatch. As fast as the queen cuts the cap, the bees seal it back up. The bees do not allow the released queen to kill the other queens. When a hive swarms, put your ear to the hive and listen for queens piping. If you hear them, the bees are planning on swarming again. Take the hive apart and cage all of the queens and put one back in the hive. After the first swarm the other queens are ready to hatch. As soon as the last swarm leaves the bees release the last queen and she is allowed to kill the other queens. I strongly suspect that this queen is much stronger than the first queen that hatched and probably goes on its maiden flight much much sooner than the first swarm queen. After 10 days you should have eggs and probably larvae that is easier Visible. Give them another 5 days and inspect. She should have capped brood by then and has proved her abilities as a queen. Jim, if I hatch a queen in an incubator she must by fed fast or she will starve. I place fondant in special tiny compartments where the queen can only get her tongue in. In other wirds, the queens are super hungry when they hatch. Which leads to my question: are the bees feeding the queen before she is sealed, lock in is a better word????? There is royal jelly in her cell but I do not think the queens can reach it. They may be able to move it down with their legs but I do not know if it is what they do. Even though the last swarm was on April 10th you cannot pinpoint the queenless/queenright issue because you don't really know the situation inside this hive before. It could be a number of issue like, the multiple virgins that did not kill off each other and issued the many after swarms. Or the last virgin got out but did not make it back on her mating flight(s.) If the last swarm leave them a virgin or a cap viable QC then you may still have a virgin in there. So the surest way is to do a hive check right now. It will help you determine whether or not there is still a virgin in there. Or this hive already depleted itself of the last remaining queen or QC. Yes, a hive with a virgin can be inspected after 5pm or just before the sunset. I would go in there to find out. I'm having the same issue. Multiple swarms from the same hives. I had to look up the bee math on Michael's website.